Heat the oil in a sauté pan over medium heat, and cook the onion and garlic stirring until golden. Add the zucchini, green beans, asparagus, Brussels sprouts, salt, pepper and thyme, and sauté, stirring, until al dente (cooked but slightly crunchy). Add the white wine and lime rind, bring to a boil for 1 minute, and add the sunflower seeds and cooked rice. Stir until everything is hot, and serve. Another way of doing this recipe is by adding the vegetables and seasoning to the rice while it's cooking. If you do this, don’t stir everything too much or the rice will get mushy. These vegetables also make a great pasta sauce. For me, there's no easier way to use seasonal vegetables or all those leftover veggies in the fridge than to make a quick and colorful garden rice. This is also an ideal way to use any extra rice left in the pan, and make a meal out of it. The only rule here is that there are no rules, and you can include absolutely any combination of veggies you want! 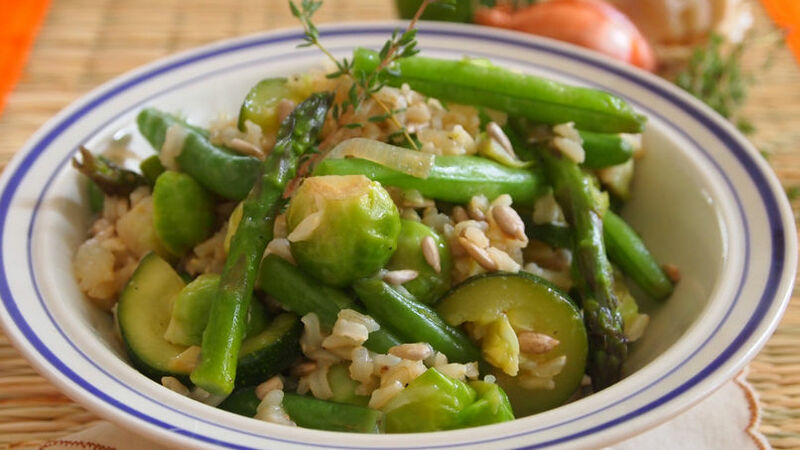 I like using brown rice or a combination of brown and wild rice, and I tend to favor green veggies. However, the decision is completely up to you. You may also want to add some extra texture by incorporating nuts or seeds, such as the sunflower seeds I sprinkled over this dish. No need to go out of your way for this. Check out what you have in the fridge and the pantry, and use it all!